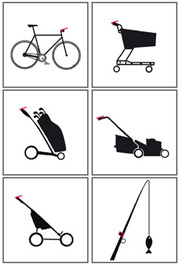 An ingenious attachment where a piece of rubber tubing, slit open lengthwise, fits around the handlebars close to the stem (or any other tube that measures 22–27 mm in diameter, such as the handlebar of a pushchair, lawnmower, golf caddy, etc.) 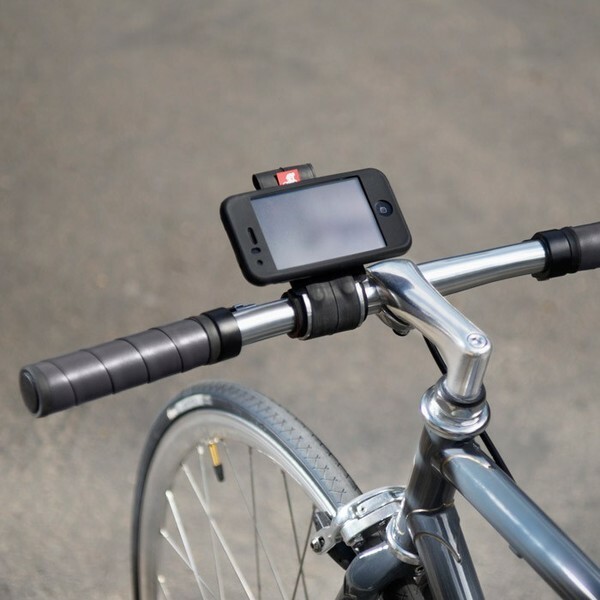 The whole thing is then tightly fixed to the bar by stretching the velcro element around the upper part of the aluminum plate; this activates an elasticized material (basically, a piece of inner tubing) that literally locks the holder onto the handlebars. Two seconds to put it on, two seconds to take it off. 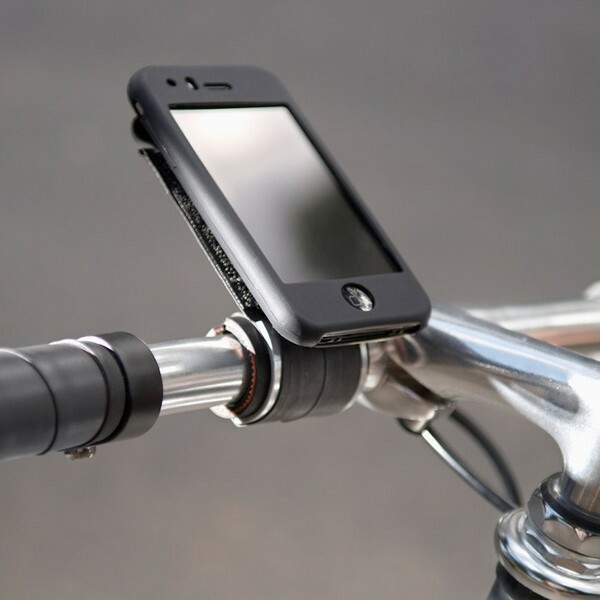 You put your iPhone® in the silicone cover, which has velcro on the back, then simply stick it on horizontally or vertically on the aluminum plate. More complicated to explain than to do! 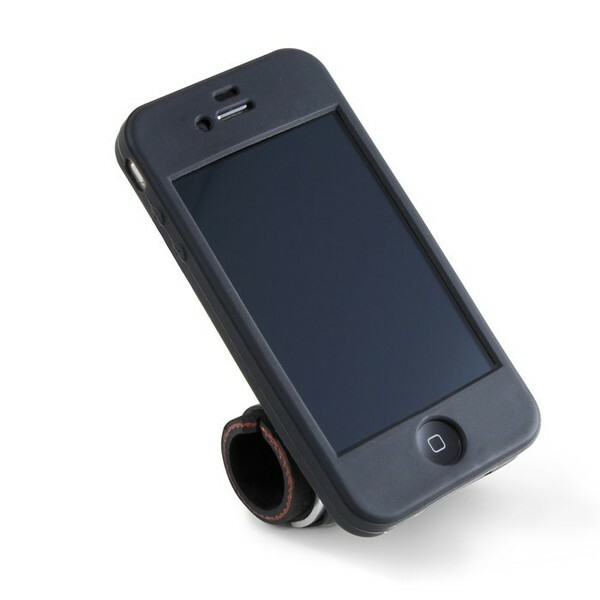 Choose the model that is suited to your phone, be it an iPhone® 3G/3GS or an iPhone® 4/4S. The attachment is the same for both, but the silicone cover must be the right size for your phone. So there are 2 different versions of this product: be careful when you order (use the pull down menu)! place the cut rubber tube around the handlebar (which should be clean and free of grease, if necessary, use the alcohol wipes that come with the product to clean) close to the stem. hold the elastic loop at the end of the rubber strap, stretch the strap (be careful to hold the middle of the loop and to pull towards the center of the aluminium plate without yanking too hard!). Attach the part with the velcro on the top of the plate (with the canvas flap provided). The tension on the strap will slacken somewhat when you let go. to change the slant of the holder, make sure to let go of the rubber strap first. put your iPhone® in the silicone cover (if it already has a cover, take it off) and attach it with the velcro in the position you wish. ... and if, like in this example, you don't want to take off your gloves to use your iPhone, try Glove Tip, a conductive chip that lets you use a touch screen with gloves on! this product is only authorized when using this appliance will not take the user's attention away from the activity being practiced: always pay close attention to traffic when using on the street. 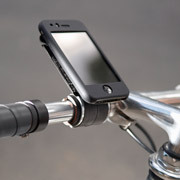 the covers are adapted to specific iPhone® models. We ask that you always use the cover adapted to your mobile phone model. Contact us if you need a replacement cover or a new cover for a different model. 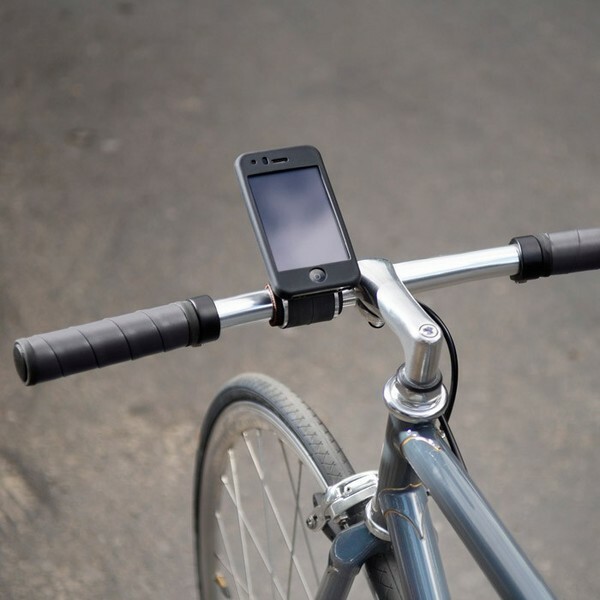 the iPhone® can be attached to the holder in portrait or landscape format; always place your iPhone® in a central spot on the bar and check that it is firmly attached by pushing on the iPhone®. the silicone cover is not waterproof. If the weather is bad, please temporarily take the phone off of the holder and put it somewhere where it won't get wet and risk damage. we suggest that every time you use the holder, you check that the mobile phone is firmly attached before starting your activity. 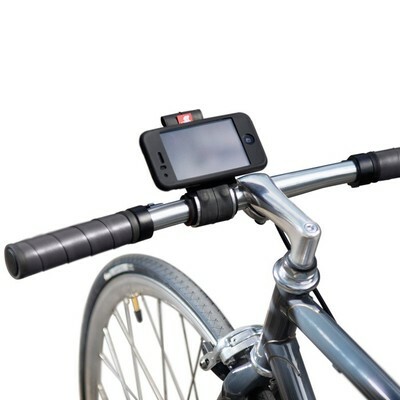 This holder was designed for non-professional use on paved roads. We guarantee that this product will function perfectly, but we are not responsible for damage or loss of objects. In Berlin—a city that is very flat and spread out and where bicycles are a major means of transport—urban dwellers are creative, appreciate recycled or natural materials, are socially ahead of the game, and have a strong ecological conscious, but most of all, they like to design functional, efficient products. it is made from quality materials, if possible natural and/or recycled: rubber for the inner tube, canvas, reinforced rubber tubing, recycled cardboard box, etc.